Jeff Wilson has a conversation with himself about StorMagic. Marco Broeken compares VMware VSAN to StorMagic SvSAN. Amit Panchal shows some British pride in UK based StorMagic. As you will have read in these posts, StorMagic have announced an offical partnership with VMware as the endorsed, nay recommended, configuration for two-node VSA deployments. If you need three or more nodes, VMware will still be recommending VSAN (of course), but for the specific use-case of two nodes, StorMagic is it. This is quite a coup for StorMagic, but they deserve their success. Do go and watch the videos from their presentation here. Regular readers will be familiar with my obsession with focus. It’s important to understand both what you are, and what you are not, in order for you to concentrate your energies where they will have the most effect. This is true both of people and of companies, who are made of people, after all. It’s amazing how often that gets forgotten, but ironically I digress. StorMagic is a company with focus. As I covered in my prep post, they sell a two-node VSA based cluster designed for Remote Office/Branch Office style deployments, and they’re very focussed on this market. StorMagic erred when they said their solution didn’t need a witness because it’s not true, and we all immediately knew it couldn’t be true. Or, if it was, they’d done something pretty amazing to get around the reasons you have a witness: to avoid a split brain situation when your cluster nodes lose contact with each other. Instead, StorMagic can use a single witness to server multiple clusters. You can have one for each cluster if you want, but that’s unlikely in the kinds of deployments that StorMagic targets, on which more in a moment. This highlights an important point for vendors trying to make their products sound special: don’t get carried away. Yes, you want to be able to point to something ‘unique’ so you have a point-of-difference from other options. People need to know that you cover the points-of-parity that anyone must have (the hygiene factors), but to stand out, you need to be offering superior value for the price than competing options. Obvious stuff. The trouble is, if you make a statement that isn’t strictly true, you end up talking about that instead of about the actual difference. Having a single witness able to service multiple clusters is a good feature, and worth discussing, so focus on that instead of trying to make it into something it isn’t. Happily, that discussion was dealt with pretty quickly and well, so kudos to the StorMagic folks for handling the situation with aplomb. My prep post ended up being pretty much spot on about what StorMagic is up to, which shows their website and published materials are working very well. The market that StorMagic is particuarly good for is even more focussed: the distributed enterprise. Think centralised management of a large number of clusters out there in the field. One in every store of a large retailer, say, or in all a bank’s branches. These are a tricky combination of ROBO and enterprise problems. It’s an enterprise style scaling problem, because you have a lot of them, and you have to manage them somehow. But each individual deployment is more like a ROBO problem, because you have little-to-no tech skill permanently onsite. The infrastructure is only there to support business operations, which are fairly static, with a small number of standard applications, so you want something with long shelf-life, high reliability, and ease-of-use, but able to run a standard sotware bundle. This is where a bunch of pundits start crying out VDI! without thinking things through. You need data and apps close to the users because of a set of reasons, not least the cost of maintaining network links. Think offshore oil rigs, windfarms, or other truly remote places. Not just a server in a cupboard in a bank branch that has pretty good network links anyway. And still, why chew up all that bandwidth just to centralise the management of software? This is where distributed management comes into play, and the techniques for doing so are important. StorMagic’s ability to have a single witness used for multiple clusters means you can create distributed failure domains. Maybe you have a single (redundant) witness for the entire corporation, housed in your datacentre. You centrally manage all the clusters from your NOC, and they’re pretty simple anyhow, so there isn’t a lot of management to begin with. Or maybe you put some witnesses closer to groups of them, like in distribution centres handling a few dozen or hundred retail locations. Again, maybe you have distributed management of infrastructure that mirrors your operations. StorMagic gives you the choice. Of course, the money side of things is a plus as well, because with StorMagic you don’t need an extra server (per site, times 1000 sites, is not small dollars any more). You don’t need an external SAN per site, and all the extra connectivity and maintenance and management that goes with it. You just have a couple of servers, which you needed anyway, and now they have some disks in them. If one dies, you swap it out with a standard server and it re-images itself off the other one. This keeps both CapEx and OpEx down, which is important because of the scale of having lots of sites. Retail has really thin margins, so savings per retail site make a big impact. What I’d like to see is the upgrade path for the future so that you can be constantly doing rolling upgrades of branches rather than an enterprise wide branch refresh project every 4-5 years. Branch refresh projects are ugly, ugly things, because it takes ages to do. The hardware for the first sites is nearly outdated by the time you get through the design stages and start to roll out (thanks ITIL/TOGAF/CoBIT etc.!) and definitely out of date when you finish. No one want to run them, because they’re boring and add no real value to the branches (generally). And it’s CapEx that could have been spent on something else, which irritates the business unit managers who didn’t get their project up because of the central IT managed branch upgrade project. Oh, and then other projects piggy-back off that one, because if we’re going to touch all the branches, surely we may as well do a desktop SOE upgrade as well, right? And what about the network? Makes sense, right? Instead, I’d love to see rolling upgrades made easier by having software compatibility, so you can just roll in a new server to replace older ones occasionally, and have a perpetual hardware refresh going on, like painting a bridge. Then the spend is smoothed out and becomes an operational expense rather than a one-off CapEx cost that no business unit wants to own. That is one of the greatest, and least talked about, advantages of “software defining” things. You get to separate hardware upgrades from the data that lives on that hardware. 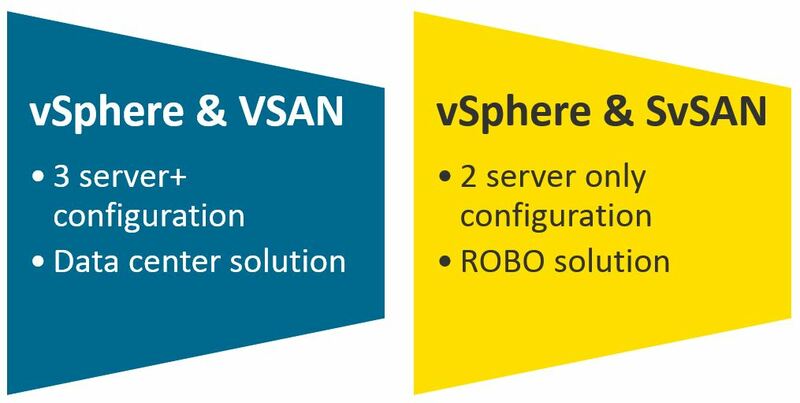 VMware have a version of vSphere called ROBO Edition (who knew!) which gives you 25 VM licenses, and as announced at PEX, StorMagic is now the officially preferred way to do storage on two-node clusters. You buy one SKU from VMware, one from StorMagic, for each site and you’re off and running. Nice and easy. It’s a good fit for VMware, who concentrate on the data-centre part of the market, so this gets their software onto servers out in the field, and keeps admins addicted to VMware’s management tools. It also provides VMware with a defensive position against Microsoft and Hyper-V at the low end of the market, and helps get people onto the VMware bandwagon before they grow. And, of course, SvSAN can scale up from two nodes if you want to do that later on. I asked StorMagic’s CEO Hans Sullivan about the company’s plan for the future, and he hinted at future partnerships to be announced in coming weeks and months. While he didn’t provide any specifics (and I didn’t really expect him to), I would expect to see partnerships with major server vendors like Dell, HP and maybe SuperMicro. Any of the major vendors on the VMware HCL would be a good match. StorMagic+VMware will ship a lot of servers. There will also be a lot of focus on the channel for the SMB market. Dealing directly with thousands of SMBs is expensive, so it’s easier to have a channel strategy where the people who are already out there dealing with the SMB customers have another option they can sell to their customers. Again, expect to see a push, and more details, coming out later in the year. Tagged SMB, stormagic, VFD4, vmware, vsan. « 2014 Hottest 100 is Here!